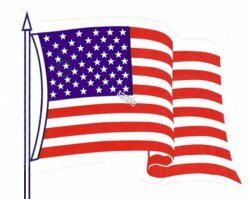 AMERICAN FLAG 50 Stars - $10.00 : Bob Hoyts Classic Inspection Stickers, Add a Final Touch to your Restoration! This beautiful Stars and stripes with 50 stars is perfect for your car after 1959 when Hawaii and Alaska were added to the United States. This sticker is available as a standard sticker or static cling that mounts on the outside window or on your dash.